Async is slower, not faster, measured in single-routine. Next, we'll roughly go through what is asynchronous I/O again, and its pros/cons in practice, as well as when asynchronous ORM can be helpful. There are yellow bars taking up extra time. non-green bars cannot overlap with non-green bars in the other thread. 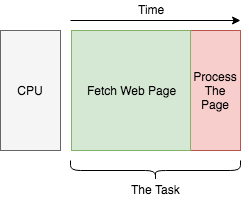 The yellow bars are time taken by context switches, a technique to allow multiple threads or processes to run on a single CPU core concurrently. Because one CPU core can do only one thing at a time (let's assume a world without Hyper-threading or something like that), so in order to run several threads concurrently, the CPU must split its time into small slices, and run a little bit of each thread with these slices. The yellow bar is the very cost for CPU to switch its context to run a different thread. The scale is a bit dramatic, but it helps with the point. Wait again here, the green bars are overlapping between threads, the CPU is doing two things at the same time? No, the CPU is doing nothing in the middle of the green bar, because it's waiting for the HTTP response (I/O). That's why multi-threading could improve the throughput to 2.7, instead of making it worse to 1.7 tasks/sec. You may try in real to run CPU-intensive tasks with multi-threading on single core, there won't be any improvement. 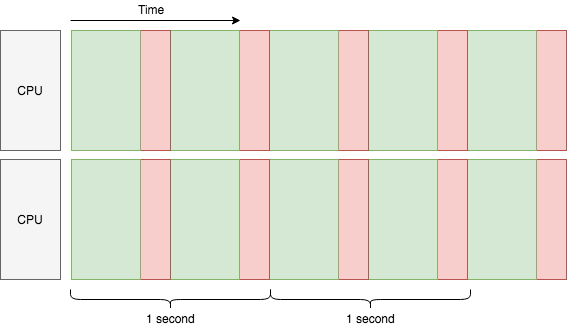 Like the multiplexed red bars (in practice there might be more context switches depending on the task), they seems to be running at the same time, but the total time for all to finish is actually longer than running each of them one by one. That's also why this is called concurrency instead of parallelism. Asynchronous I/O and coroutine are two different things, but they usually work together. Here we shall not follow too deep into the rabbit hole of low-level asynchronous I/O, and stay with coroutines for its simplicity. Awesome! The throughput is 3.7 tasks/sec, almost as good as 4 tasks/sec of 2 CPU cores. Though this is not real data, comparing to OS threads, coroutines do take much less context switch time and memory footprint, thus made it an ideal option for the C10k problem. In the last diagram above, you may have noticed one difference comparing to all the other previous diagrams: the green bars are overlapping within the same thread. That is because the last diagram is using asynchronous I/O, while the rest are using blocking I/O. Like its naming, blocking I/O will block the thread until the I/O result is ready, thus there can be only one blocking I/O operation running in a thread. To achieve concurrency, blocking I/O has to go for multi-threading or multi-processing. Oppositely, asynchronous I/O allows thousands (or even more) of concurrent I/O reads and writes within the same thread, each I/O operation only blocks one coroutine instead of the whole thread. Like threads, coroutine here is a way to organize concurrency with asynchronous I/O. Thread 1: I wanna run! Thread 2: I wanna run! OS: Urh, alright one sec ... Thread 1, hold on for a while! Thread 1: Well I'm not done yet, but you are the boss. OS: It won't be long. Thread 2 it's your turn now. Thread 1: Can I run now? OS: Just a moment please ... Thread 2, give it a break! Thread 2: Alright ... but I really need the CPU. OS: You'll have it later. Thread 1, hurry up! Coroutine 1: Let me know when event A arrives. I'm done here before that. Event manager: Okay. What about you, coroutine 2? Coroutine 2: Um I've got nothing to do here before event B. Event manager: Cool, I'll be watching. Event manager: (after a while) Hey coroutine 1, event A is here! Coroutine 1: Awesome! Let me see ... looks good, but I need event C now. Event manager: Very well. Seems event B arrived just now, coroutine 2? Coroutine 2: Oh wonderful! Let me store it in a file ... There! I'm all done. Event manager: Sweet! Since there's no sign of event C yet, I'll sleep for a while. Event manager: Damn, event C timed out! For coroutines, a task cannot be paused externally, only the task itself could pause from within. When there are a lot of coroutines, concurrency depends on each of them shall pause from time to time to wait for events. If you wrote a coroutine that never pauses, it allows no concurrency at all when running. On the other hand, you should feel safe in the code between pauses, because no other coroutines could run at the same time to mess up shared states. That's why in previous last diagram, the red bars are not interlaced like threads. In Python and asyncio, async def declares coroutines, await yields control to event loop (event manager). Asynchronous I/O may handle tens of thousands of concurrent I/O operations in the same thread. This may save a lot of time from context switching, and memory from multi-threading. Therefore if you are dealing with lots of I/O-bound tasks concurrently, asynchronous I/O could efficiently use limited CPU and memory to deliver greater throughput. With coroutines, you can naturally write sequential code that is cooperatively scheduled. If your business logic is complex, coroutines could greatly improve readability of asynchronous I/O code. However for single task, asynchronous I/O is actually making it slower. For a simple recv() operation for example, blocking I/O would just block and return result, but it needs quite some steps in asynchronous I/O: register for the read event, wait until event arrives, try to recv(), repeat until result returns, feed the result to a callback at last. With coroutines, the framework cost is even larger. Thanks to uvloop this cost has been minimized in Python, still it is overhead comparing to raw blocking I/O. And, asynchronous I/O is unpredictable in time, because of its cooperative nature. For example, in a coroutine you want to sleep for 1 second. But another coroutine took the control and ran for 2 seconds. When we get back to the former coroutine, it is already 2 seconds later. Therefore, sleep(1) means to wait for at least 1 second. In practice, you should try your best to make sure that all code between await should finish ASAP, being literally cooperative. Still, there can be code beyond control, so it is important to keep the uncertainty in mind all the time. At last, asynchronous programming is complicated, it's easier said than done. Debugging is a tough job too. Especially when a whole team is working on the same piece of asynchronous code, it could easily go wrong. Therefore, a general suggestion is, use asynchronous I/O carefully for I/O-bound high concurrency scenarios only. It's not a drop-in replacement for performance boost, but more like a sharp blade for concurrency with two edges. And if you are dealing with deadline-intensive tasks, think again to be sure. Finally, GINO. We assume a scenario that asynchronous I/O is anyway required for the server itself, regardless of how we handle database. Now that we know asynchronous I/O is for I/O intensive tasks. But isn't it I/O intensive to frequently talk to a remote database? It depends. Like Mike said, "intensive" is relative to your actual code. Modern databases are super fast and reliable, network is reliable if put in LAN, therefore if actual database access time is of the minority of the program, it is not I/O intensive. Using asynchronous I/O for database in this case could not improve throughput much, or even make it worse due to asynchronous framework overhead as we mentioned. It looks easier to just use blocking database operations in your coroutines instead without harming performance. But there is a high risk to cause dead locks. For example, the first coroutine starts a transaction and updated a row, then the second coroutine tries to update the same row before the first coroutine closes the transaction. The second coroutine will block the whole thread at the non-async update, waiting for the row lock to be released, but the releasing is in the first coroutine which is blocked by the second coroutine. Thus it will block forever. A simple fix would be to defer the database operations into threads, so that they won't block the main thread, thus won't cause a dead lock easily. It usually works and there is even a library to do so. However when it comes to ORM, things become dirty. Traditional ORMs are usually implicit for convenience, lazy property loading for example. In a larger project, you never know which statement has a side effect to make an implicit database call, and block the main thread. Since you cannot put only the underlying database access into the thread pool (you need to await on the deferred database call), you'll start putting pieces of code into the thread pool. But coroutines run only in the main thread, your code starts to fall apart. This is usually the time when I suggest to separate the server into two parts: "normal blocking with ORM" and "asynchronous without ORM". Eventually this is where GINO can be useful: convenience of database abstraction is wanted in a classic asynchronous context. And thanks to asyncpg, the asynchronous overhead is by far still buried in its incredible performance boost.